19-22. . . . No act is done according to nature that is not an act of concupiscence against God. Every act of concupiscence against God is evil and a fornication of the spirit. What about people who do good things? Luther undermines it all. Every act is self-loving act against God. If we ponder this, it should really make us think twice before preaching for behavioural change without true heart change. 23-25 – Luther critiques the notion that hope overcomes self-love. Instead of seeing value in our own merit, he points to suffering as the seedbed of hope since suffering destroys a sense of merit and worthiness. As preachers we have to ponder the perennial problem of the fleshly tendency to err toward earning something spiritually. 26-28 – We don’t make the first move toward God, He makes the first move toward us. And if we suggest that our move toward God is something we can do by nature, followed by His gracious response, then we are back to the Pelagian error again. Sometimes we preachers preach as if it is down to our persuasive efforts that people will be stirred to move toward God. 29-30 – God’s election is the first move toward a grace-based relationship between God and man. We don’t prepare ourselves by becoming more holy. In fact, perhaps our rebellion against grace is the preparation from our side (since we bring nothing to the table). So as preachers, let’s not subtly fall into the idea that influencing our listeners toward holy living is somehow a step toward their salvation. 31-36 – From our side we can’t do anything to remove obstacles to grace, and actually, there is nothing about us that would want to even if we could. Luther had a clear sense of our totally lost state, but many of us fall into the common idea of our times (indeed, all times), that humans have a basically good will. 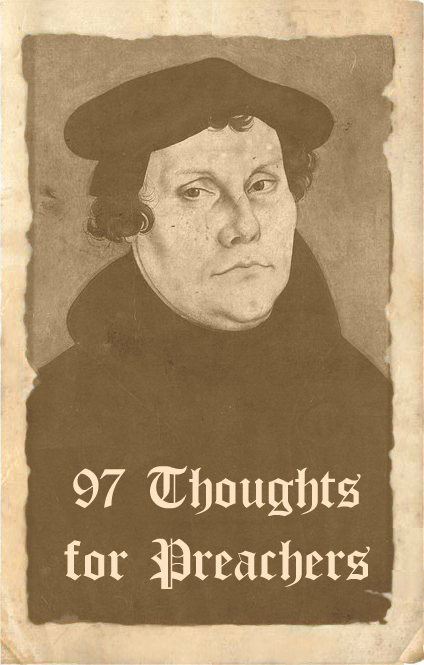 I hope pondering Luther’s 97 is provoking your thinking as it is mine. Whether he is right or not, let’s be sure to chase into the Bible and see what it has to say on these issues!